Video clip synopsis – ALTOS - an online chat community based in Germany - provided a 'world without borders' for its members. Broadband MP4 onlinecommunities_bb.mp4 (9.6MB), suitable for iPods and computer downloads. 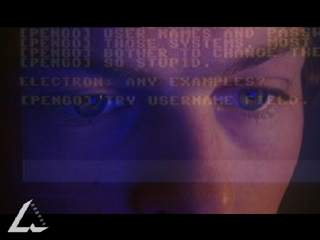 This video clip is an excerpt from the film In the Realm of the Hackers, produced in 2001. In the Realm of the Hackers is a Film Australia National Interest Program produced in association with John Moore Productions and with the assistance of Film Victoria and the ABC. The video clip is on the website From Wireless to Web, produced in 2005. The interviews with Trevor Barr and Scott Goodings were recorded for the website. This area of study focuses on the social consequences of the emergence of new media technologies. The creative implications of new media technologies are considered in the context of the capabilities of the technologies, their relationship with existing media, how they provide alternative means of representation and distribution of media products. Their cultural significance is investigated in terms of how they challenge and alter our perception of the world through the media products that can be produced and consumed, and the changes, possibilities and concerns that may arise in society. Technological advancements in the media occur within the context of the society in which they are created, developed and used. Such developments, therefore, not only affect media products themselves but also change the processes involved in production, distribution and consumption. In many instances they may also influence the nature of the reality (the event) being depicted by the media; for example, digital imaging techniques have allowed the manipulation (that is altering, distorting, mutating and reshaping) of photographic representations. The convergence of new media technologies, digitisation, computerisation and high-speed data transfer create new pathways for the transmission, exchange and storage of both existing and new forms of information and entertainment. Issues such as ownership, copyright, privacy and access gain new significance in terms of the relationship between media technology and the circulation of representation. A 'community’ could be described as any group of people who share beliefs or a feeling of belonging together or a common interest or purpose. The Internet and Web have created the possibility of 'virtual communities’ with new and different kinds of human relationships. With new communications technologies, people who might never meet face-to-face 'meet’ online, where they share thoughts and ideas, express feelings, form attachments, even work in highly collaborative ways. Relationships online take many forms – they can be one-to-one, one-to-many or many-to-many. Together these virtual relationships are the basis of online communities, which function through email and two-way mailing lists, discussion groups and forums, via document and file exchange, real time 'chat’, and by working or playing in virtual spaces known as Multi-User Domains (MUDs). Do you belong to an online community? How often do you access it? Is it better, worse or just different to a local community? Why? If you don’t belong to one, what sort of online community might you see yourself joining? What advantages do you see in belonging to an online community? What disadvantages might there be? What dangers do you think there might be in online communities?